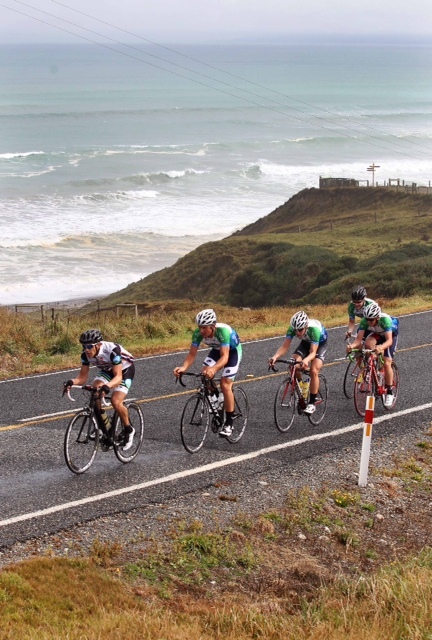 Saturday morning saw the riders leave Riverton cemetary in calm mild conditions on a testing course through Otautau, Scotts Gap and Pukemaori to Tuatapere. 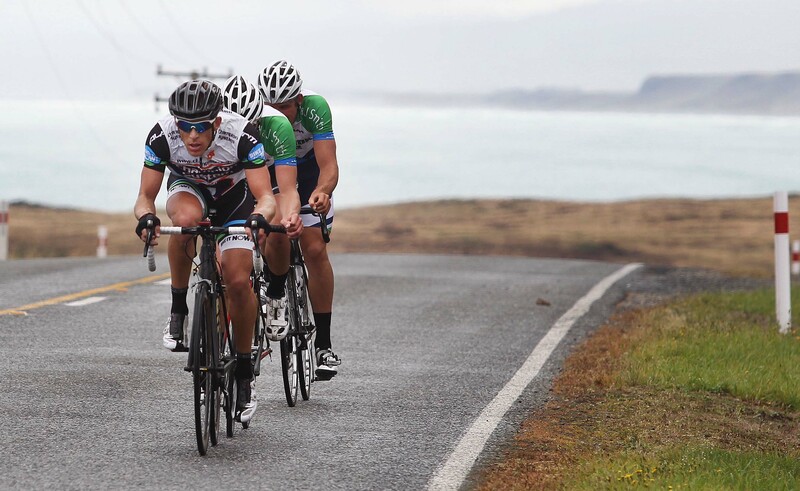 A small field of A grade got to Scotts Gap before the turbo trio of Cam "the killerwatt" Karwowski, Luke "eat my dust" McPherson and Josh "hanging on" Haggerty turned up the heat and put 7 minutes on the rest of the field. Luke had the pressure on the front and surprised his younger duo when he bolted a kilometre from to take the win by 5 seconds from Karwowski and Haggerty. The afternoon had similar theme in a calm day down the picture perfect coast to Riverton, with McPherson powering away to put 90 seconds on Karwowski then Haggerty at the finish, to maintain that order for the day's overall result. A large B grade of 20 riders also had plenty of fire power over the Scotts Gap hill climb to see 6 riders escape and work the field over. Aaron (don't leave me behind) Sinclair and 2 battlers chased back on over the rollers. In the sprint into Tuatapere Michael (see you in A grade next week) White comfortably rolled Alistair (Red) Burnett from Neil (87 RWC All Black Physio) Familton. In similar fashion in the afternoon stage White, Familton and Geoff Van (demon) Dam headed the break aways in a tight finish, with enough on the rest of the field to claim the overall grade results for the day in that order. A dozen willing C graders charged their way to a similar outcome, with 6 breaking away and uniting to stay away with Dave Maynard edging Erin "charging hard" Criglinton from Allan "may be B Grade" Milne. 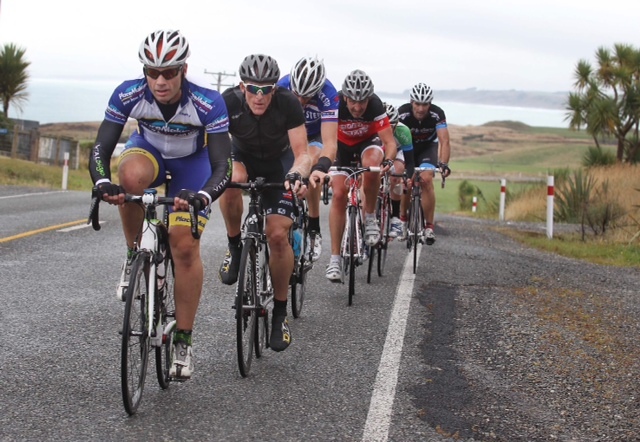 In the afternoon Alan even more likely B Grade" Milne rode away on the last hill climb into Riverton to put a minute on Grant (the engineer) Colbran and Martin "Plodding along" Lohrey. They had enough time over the chasers to claim overall honours for the day, to finish Milne, Marty (we owe you $) Lohrey and Colbran. 3 D graders set off in the morning with Ivana "the diesel engine" McDowdl looking too strong for Gordon (all the way from Te Anau) Ashton on the hills and Mary "Mrs Consistency" Marshall to enjoy their battles over the day.